Lots of Generations to choose from. Discussion in 'Items For Sale or Trade' started by WheelJacksWrkShp, Aug 12, 2010. I have all the instructions, accessories, and card backs for these guys. 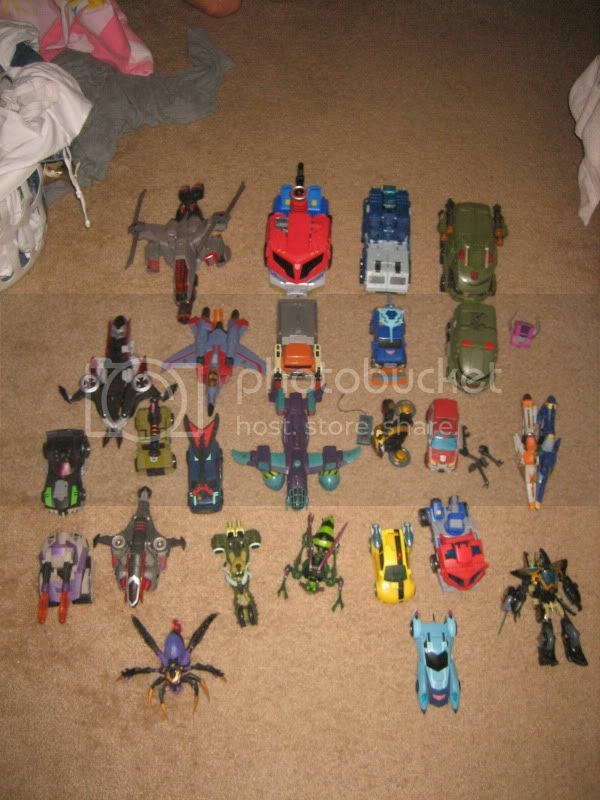 The only ones not pictured is Jazz and my Dinobots. Jazz I will sell too but he is at work on display. The dinos are going to hang with me for now unless someone just has to have them. Anyway, check the pic out, I will take individual pics upon request. I use ebay and BBTS for my current pricing since mine are in display condition. Make a reasonable offer and we can make a deal. This is the stuff I hope to aquire at some point. Please let me know what you have and how much you're willing to sell it for. If you can post pictures of what you have for sale that would be useful. Thanks!!!! I am entertaining offers but not looking to give them away. Yeah I know. Just a lot to photos to take. Forgot to mention that I have RID Prime and Magnus where they combine into the big one. I'm holding on to my Dinobots. I know they are going to be popular and worth more later on. That and I really like them. Then how 'bout $15 shipped for Soundwave and Swindel? I will sell them both for $25 shipped. I will just hold on to them then. Thats less than $10 a piece and they are going from $15 - $25 a piece. Thanks for your interest though. I was going to make an offer on other figures, but will refrain as that quote for Soundwave and Swindle seems a bit high (unless you're basing them on sealed packages and uncompleted auctions). If you have prices in mind, it might be best to post them. It would save potential buyers and you some time. I don't have prices in mind. If you know what you want to spend let me know. I go on BBTS and Ebay and look at what loose figures go for. If you price is less than half then don't expect nothing. We are all collectors here and there is no harm in negotiating but I am not going to get taken on something I enjoy having.